A new product is emerging in the area of ejector systems, the patented Hijector­ liquid ejector. 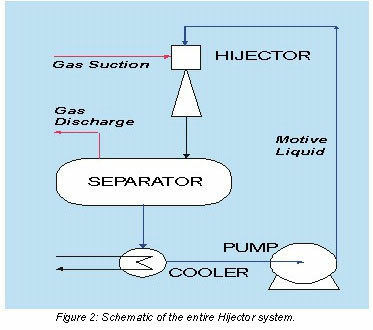 The Hijector system is different from traditional steam ejector systems because its motive fluid is a liquid rather than steam. Using a liquid as a motive fluid has several benefits: energy savings, emissions reduction, and simple operation and maintenance. The ejector operates off the Venturi principle. Figure 1 shows how the motive liquid is flowed through the nozzle and into the mixing chamber. As the cross-sectional area of the mixing chamber is reduced, the velocity of the liquid is increased. In other words, potential energy is converted into kinetic energy, or static pressure is transformed into dynamic pressure. As the liquid accelerates, the static pressure falls. This generates a vacuum, which induces the gas into the mixing chamber. As the gas/liquid mixture enters the diffuser, the static pressure begins to recover. The gas is now being compressed as it approaches the discharge. Thus, the Hijector acts as an evacuator and a compressor. Figure 2 shows a typical Hijector system. 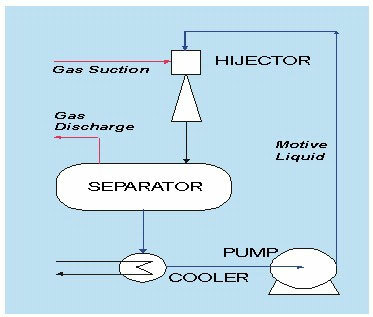 As the liquid/gas mixture flows out of the ejector, the mixture is separated in a two-phase separator. The gas is discharged for further processing and the liquid is sent to a heat exchanger (heat is usually absorbed from the gas being evacuated). The liquid is then pumped back to the ejector and the process starts all over again. These are just a few examples. The system has also been applied successfully in such other areas as municipalities and universities. In all cases, the Hijector system brings with it simple operation and maintenance, low utility costs, and lower emissions. For more information: Hijet, 4615 Post Oak Place, Houston, TX 77027. Phone: 713-963-8900. Fax: 713-963-8295.